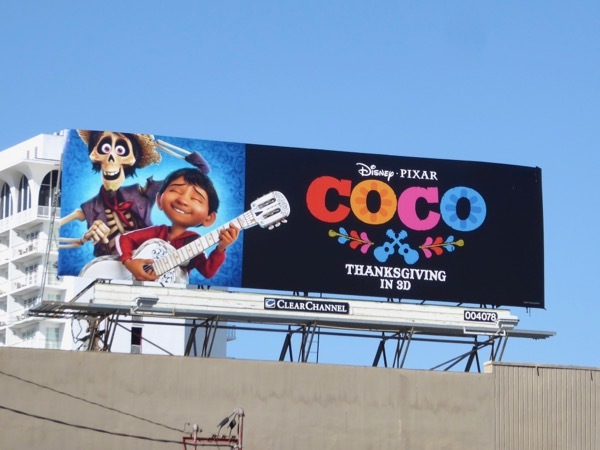 This Thanksgiving if this world is getting you down and you're looking to be transported to another, better place, then Disney/Pixar have delivered another heartwarming tale to lift your spirits (and no doubt make you cry) with Coco. 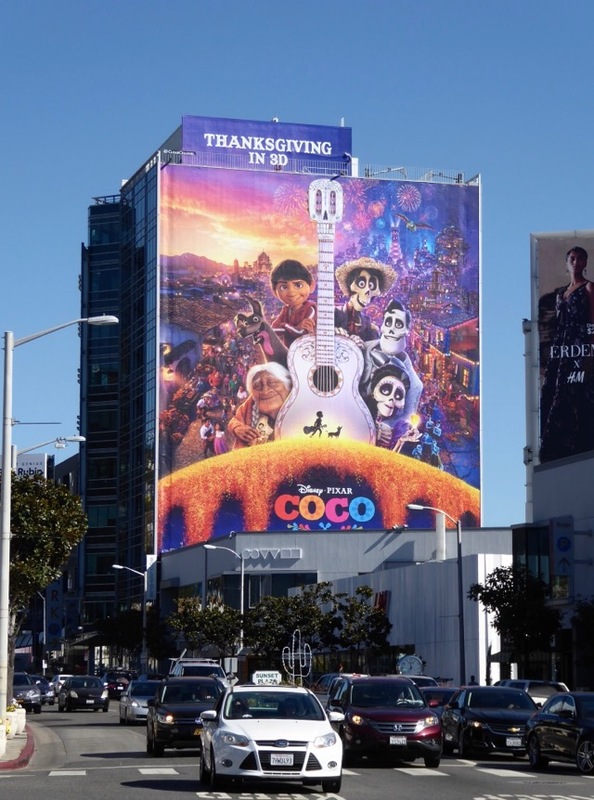 Already breaking box office records in Mexico, this new computer-animated story follows young 'Miguel' (voiced by Anthony Gonzalez), who despite his family's generations long ban on music, dreams of becoming a musician like his idol 'Ernesto de la Cruz' (Benjamin Bratt). 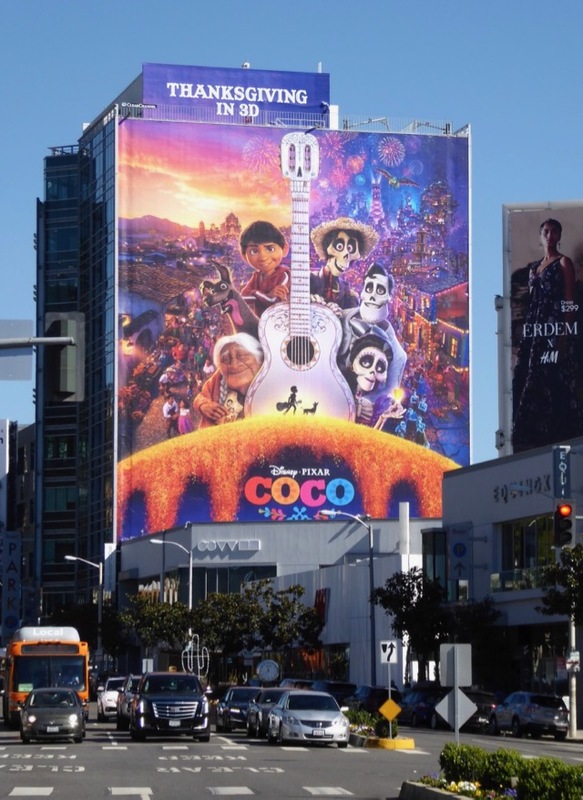 Determined to play at the Dia de los Muertos festival he borrows the guitar of his musical hero from a mausoleum and finds himself magically sent to the Land of the Dead. 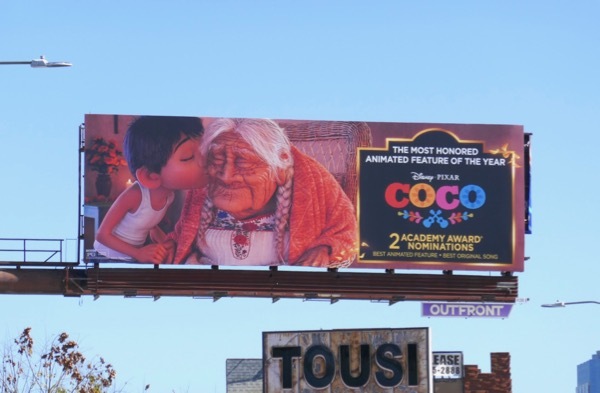 There he meets the mischievous spirit, 'Hector' (Gael García Bernal), and together they embark on a journey to discover the real truth behind Miguel's family history. 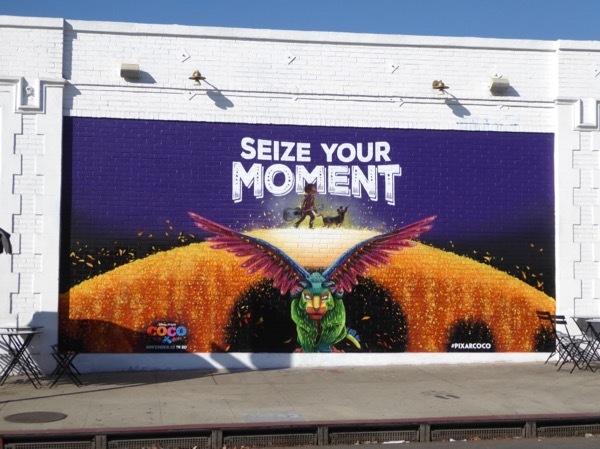 These colourful movie billboards and wall murals were photographed along Highland Avenue, Beverly Boulevard, Sunset Boulevard, Pico Boulevard, Vermont Avenue and Melrose Avenue from November 4 to November 18, 2017. 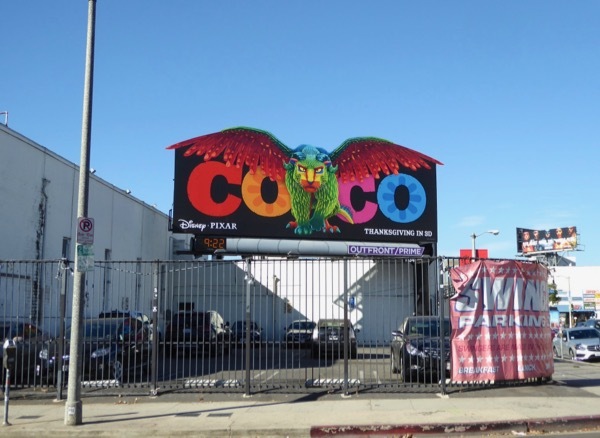 Daily Billboard especially likes the billboard featuring the winged spirit animal, 'Pepita', and in Studio City along Coldwater Canyon and Valleyheart Drive there's even a version of this special extension cut-out which features a patented UV printing process that fluorescently glows in the dark illuminated by black light. 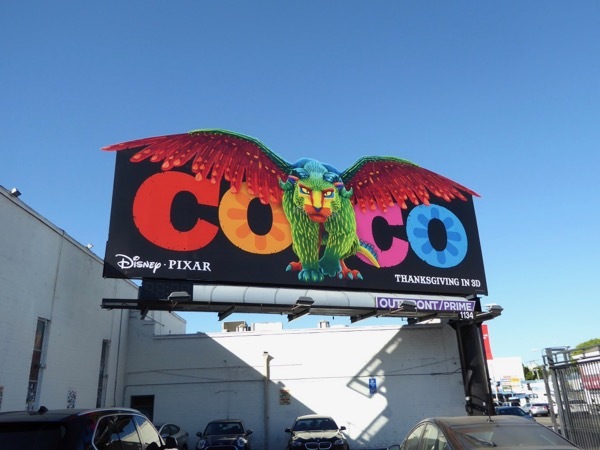 Disney/Pixar movie fans can also enjoy these Brave movie billboards, these Inside Out movie billboards, these Finding Dory movie billboards and these Toy Story 3 movie billboards. 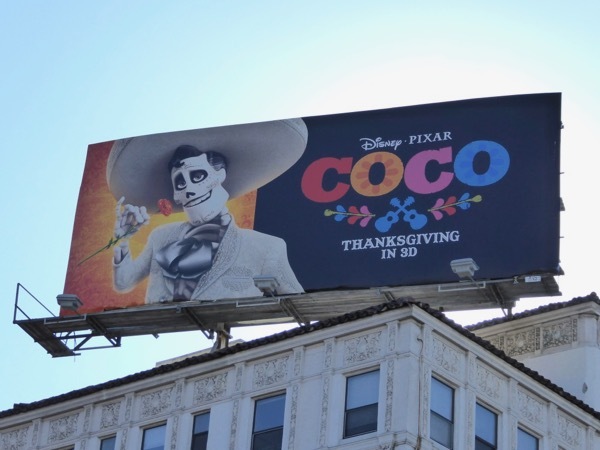 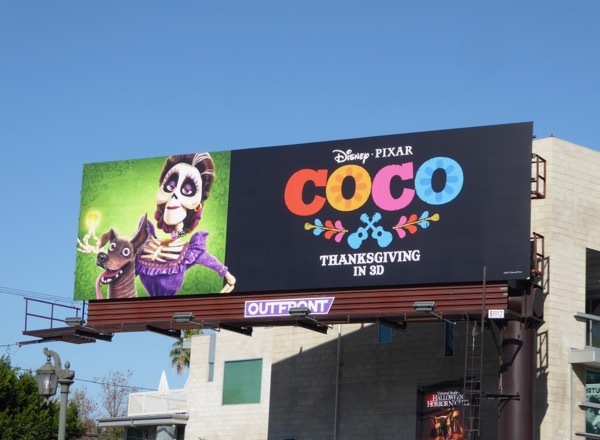 Meanwhile for more Day of the Dead-inspired ad creatives, make sure you check out these film billboards for The Book of Life. 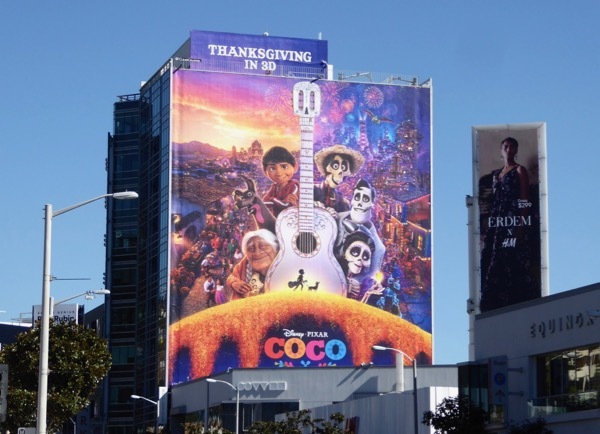 If you're looking for a film with heart, stunning visuals and a celebration of family and culture this Thanksgiving, then Coco may be just the holiday tonic you're looking for. 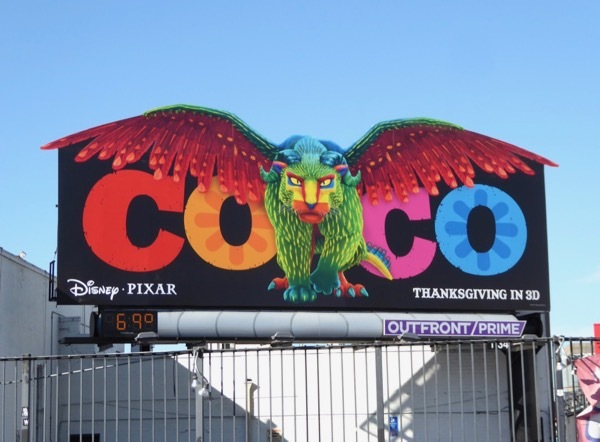 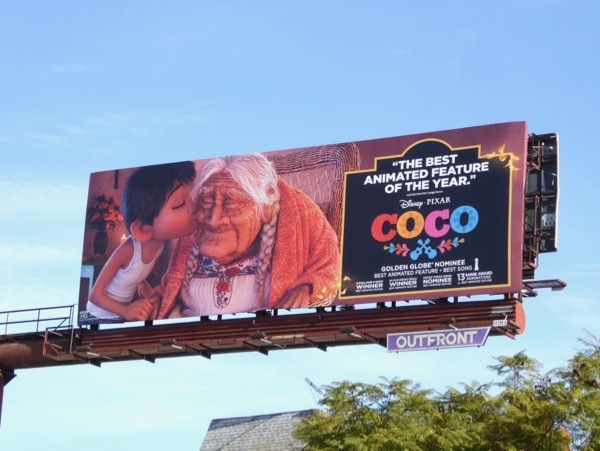 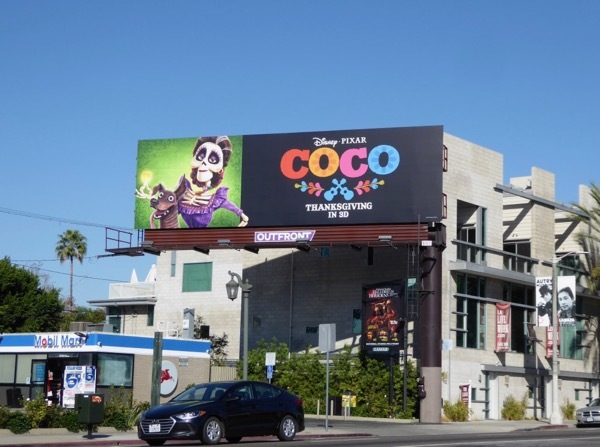 UPDATED: Here's also an awards consideration billboard for Coco, which has already won the Golden Globe for Best Animated Motion Picture, snapped above Santa Monica Boulevard near Westwood Boulevard on January 15, 2018. 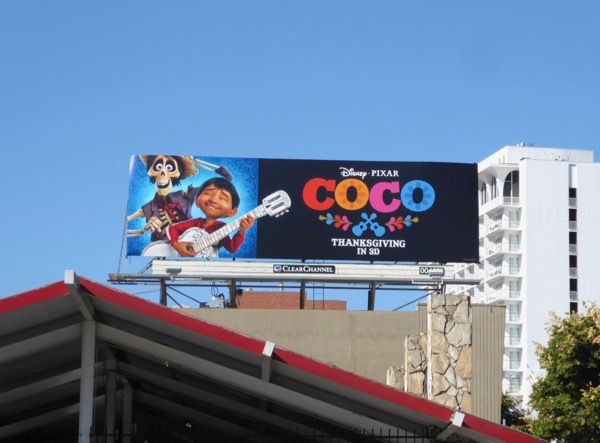 Plus here's an Oscar nominee billboard snapped in the same ad location on February 25, 2018.